Understanding the CONNOTATIVE and DENOTATIVE meaning of words is a significant part of understanding an author’s craft and word choice in literature, and it has your students diving deeper into a text, using their analytical and higher level comprehension skills. 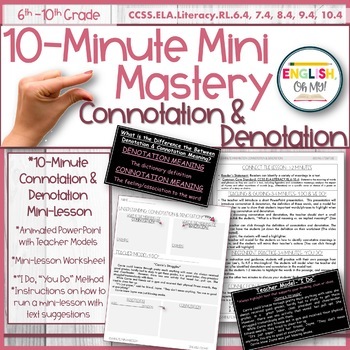 This 10-minute mini mastery lesson will have your students comprehending, practicing, identifying and mastering connotation and denotation of words in a text in a short amount of time. In addition, your students will also be able to identify how word choice and its mean can impact a text and the mood of the text. Teaching a mini-lesson is an integral part of a classroom. 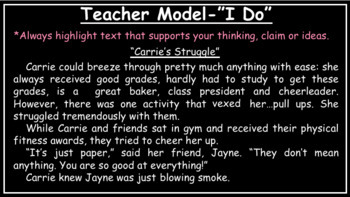 It gives the students an opportunity to see the teacher model a skill or term, and then the students practice this on their own. These mini-lesson follow the “I Do/”You Do” method. ⭐Click HERE to follow my store. You will receive updates and releases of my products and freebies. ⭐make copies for your own classes only. ⭐AS LONG AS no other teacher has access to that class webpage. This resource is for you, the purchaser, alone. ⭐make copies for other teachers or their classes. 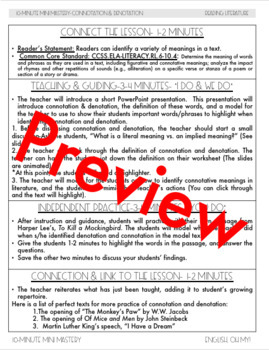 ⭐distribute this digital resource to other teachers. ⭐post this resource on any webpage or server that is available for public view, for other teachers.